Description A contemporary dining chair that oozes style and appeal. 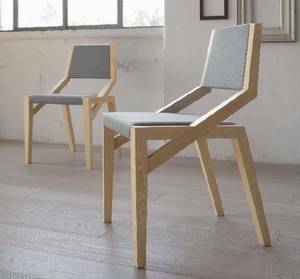 The angular frame is made from solid wood in the finishes dark oak, oak tobacco or natural ash, or matt lacquered in a choice of colours with the grain still visible. The seat and back is upholstered in a wide range of fabric and leather colours. See corresponding colour charts below for all wood, fabric and leather options.